Ever since Google announced the Readerpocalypse I have been taking time every few days to post a short review of one or more possible alternatives. All of the services I tried were intended to work in a desktop web browser, but today I plan to take a different tack. I've been in need of a mobile news reader for a while now, and I thought it would be useful to jot down my notes and share my opinion. Update: I've added another news reader app (because it now works with BazQux). At this point I would recommend Mr. 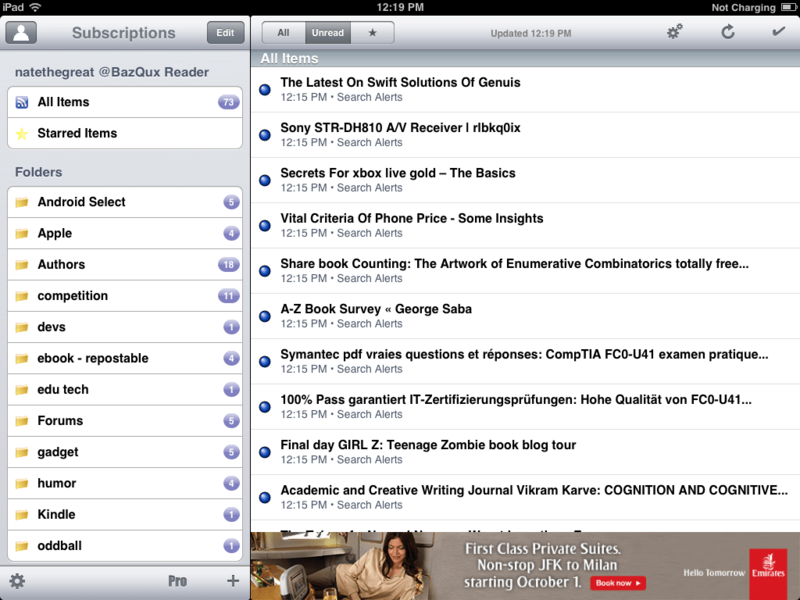 Reader and (if you want to use Android) JustReader. The other apps aren't as good (IMO), are less polished, and I just don't like them as much. But the other apps are generally functional. The initial 4 apps cover all of the bases: sharing options, starred content, "show only unread" viewing mode, and so on. The 4 apps are more feature complete than most of the news reader services I have reviewed over the past few months, so there's little to dis-recommend any of them. Update: I've just tried Press, and my opinion stands. Mr. Reader is still the best option. First, why these apps and not any others? Two reasons. These are the apps that work with BazQux, my preferred news reader service. Also, many mobile news reader apps cost money and I am not willing to throw my money away by spending it on an app I can't use for the long term. BTW, if you happen to be developing a mobile news reader app and want to send me a free copy, drop me a line. I'll review your app. I didn't grab a screenshot, but there are actually several reading modes. "Web" shows the original webpage, while Instapaper, Readability, and Pocket show the full article sans ads. They grab the article from the web page, so this app would be a good choice for reading articles from blogs that only post excerpts to their RSS feed. I like the app, but it seems to be missing the title only view that I want (in the article list). But on the plus side it does offer a bevy of formatting, sharing, and filtering options and the starred and marked as read actions get passed back to BazQux in a timely fashion. This app is significantly less pretty than Mr. Reader. It's available in paid and free versions for iPad and iPhone, and it (currently) syncs with BazQux, FeedHQ, InoReader, and The Old Reader. As you can see, there are 2 reading views, and both are ruined by the ad at the bottom of the screen. The second reading view grabs the full article from the website and shows it sans ads. This could be useful for feeds that only include article stubs instead of the full article. The free version of Feeddler is supported by ads, and if you pay $5 you can upgrade and get Pocket and Evernote integration and more mark as read options. I will not be upgrading; I object to the limited features and ads on the free version. When you combine that with the unappealing appearance it is enough to drive me away. I had to test this app on my Nook HD+ (I dropped my Nexus 7). I used the tablet mode to make use of the screen size, but there is also a more linear layout designed for smartphones and smaller screens. The layout and behavior was a little confusing at first, and I discovered that there were numerous ways to view a folder full of feeds. I ended up having to test this app on my KFHD because B&N won't let me install 3rd-party apps on the Nook HD+. That was good for me because I got to test out the Ivona TTS option. That sounds a lot better than the usual Android TTS. Here's what it looks like on the KFHD: There's also a title only view which isn't shown, and a "web" reading mode which can pull in the source webpage, ads and all. This is a minimalist style app for Android. it offers just the one gray colored layout which works well on a smartphone sized screen but not so well on a tablet screen. This app works via the Fever API, which required that I select the Fever option and then enter the BazQux URL and my mobile login info. While Press doesn't offer the multiple view modes (title only, excerpt, stub, etc) of other apps it does have a Readability/Instapaper mode which can pull the full source article and display it in the app. While I mainly tried this app on my HTC smartphone, I also played with it for a few minutes on my Nook HD+. It didn't look good, and this is definitely a smartphone-only app. Is E-ink Working on an Ultra-HD Screen? Updated: Did Google Really Delete eBooks Just Because the Owner Was in the Wrong Country?